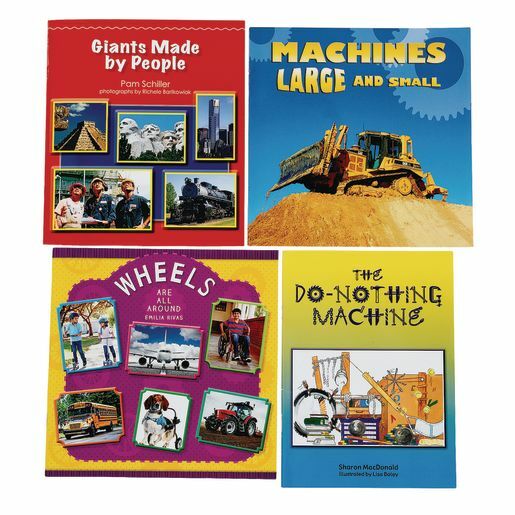 Learn about machines large and small with this collection of 4 STEM books from Frog Street! "Giants Made By People": Visit the Great Wall of China, the Washington Monument, the tallest building in the world and much more as you explore man-made giants from long ago and today. 16 pages. "Machines Large and Small": In this nonfiction book, bulldozers, graders, rollers and front loaders work to make a new road where an old road used to be. A fun look at how machines help us. 16 pages. "The Do-Nothing Machine": In this rhyming story, John spends long hours using his creative imagination to build a machine out of wood, nails and string. What does the machine do? "It was not important what it could do. The fun was in building, not getting through." 24 pages. 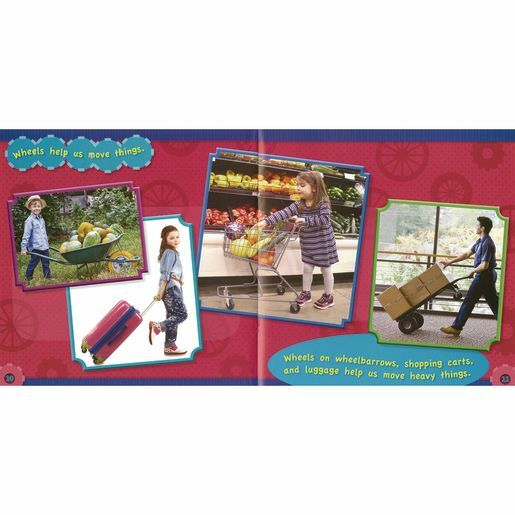 "Wheels Are All Round": Explore various ways wheels help move things and take us places. 16 pages.